You would have laughed, anyone would. They certainly did. The black lycra shorts; the primary colours in the close fitted shirt; the polycarbonate helmet that when it rained wet his hair in stripes. The laugh was that he was pushing his Dawes tourer instead of riding it, in spite of twenty-four gears. The rush of air passing him wasn’t a sudden veer in the southwesterly wind but a peloton of the local cycling club. Yes they nodded and called monosyllabic encouragements as they ought but Bryan could feel rather than hear their derision. He was sufficiently embarrassed to remount as soon as the incline decreased. He was out of condition, too lazy, too heavy and ashamed. A lone ragged hawthorn framed the mist-capped Cyrn-y-Brain mountain, the view giving Bryan the excuse to dismount again. The lane wound round the tree and then down towards a hairpin bend known as World’s End. He saw the yellow splash of the riders whipping round another bend a mile away. As the epitome of strength and endurance disappeared, Bryan swallowed two mouthfuls of isotonic sports drink. The label promised him an instant boost of glycogen to his muscles. His legs should go like egg-beaters but he was taking no chances: the rest of his journey was downhill. His hands gripped the drop handlebars. There was a fine balance between the psychological need for speed with head down and preparation for disaster with open-fingered gloves ready on the brakes. On the way up, the effort of climbing the steep lanes made him wonder why he bothered. On the way down, the freewheeling and rush of wind in his face told him why. Another lean into a bend. A few stones fly sideways squeezed by high pressure tyres humming on the grey tarmac. He couldn’t hear the slosh of the remaining drink in its bottle. This was it. What it was all about: clean air, being higher than your house and high on exhilaration. The lane meandered round another moorland bend and became narrower. The potholes increased in frequency and the surface changed from tarmac to compacted gravel forcing him to slow down. He didn’t remember the road being like this. 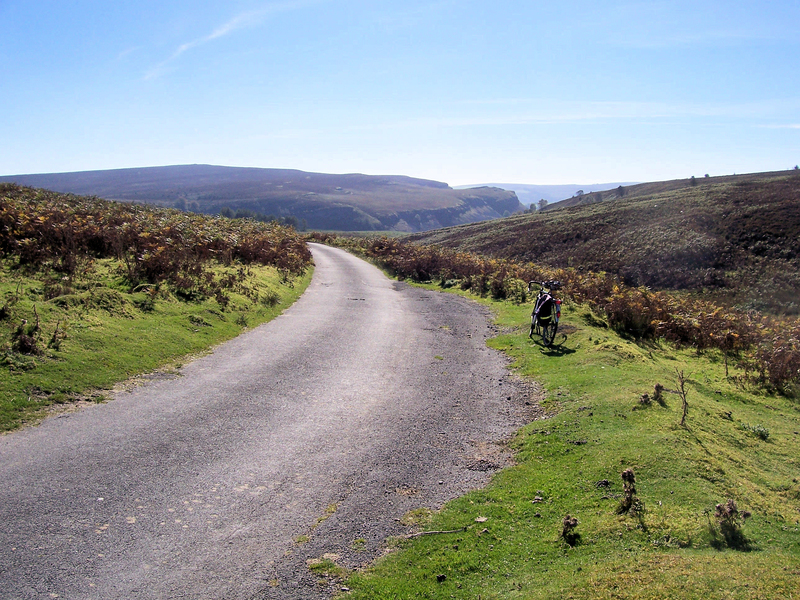 The whole road from Minera to Llangollen was narrow but properly surfaced. He must have followed his wheel’s inclination to take the path of least resistance and went straight on when the proper road bent to the right. Navigation was sometimes a casualty of downhill head-down flight. He dismounted near a large rock. He stood on the stone to look back. He could see the familiar purple-heathered morphology of the moors, Cyrn-y-Brain topping the other side of the valley to the west but not the lane. You could be a hundred miles from anywhere up here. It was another reason why he liked it so much. There was unpretentiousness in the austere beauty. Of course humans had influenced the landscape but it was as close to nature as it could get. “Ah well, backtrack it is boys,” he said to himself. He remounted but the path was rougher than it seemed a few minutes before and he frowned. He pushed the bike over the rough path fully expecting to find the smoother lane any moment. It didn’t happen. The path became a track and petered out altogether. “What’s wrong with me?” He rarely made sober navigational errors. He stretched up looking west. The skyline was as he remembered. By pushing and carrying his bike towards the distinctive peak of Cyrn-y-Brain he should intercept the road. After ten minutes he leant his bike against a boulder then bog-hopped across tufts of cotton-grass and bright green sphagnum moss. His nose twitched with the wet earthy aroma. He tripped and dived headlong down the convex slope. “This is ridiculous,” he cried out loud, frightening off a Golden Plover warbling its koo-eeing as it took flight warning other inhabitants of the approach of a madman. Bryan stopped to admire the plumage and take stock. If he continued down this awkward slope he would get bogged down in the tributaries to the Eglwyseg River. He must have missed the lane. Maybe the track he wrongly took was to the right of the main lane and not the left as he supposed. In which case he had to backtrack up hill and head east. He clambered on top of another large rock to look southwest. Ever since he first cycled on this route over twenty years ago, the rusty remains of a car decayed in the valley bottom. He’d often looked at it from the road as it contoured above, wondering what had happened. Perhaps it was just a dumped wreck but maybe it was full of revellers who, like him, took a wrong turning. He couldn’t see it. It might have been removed or he was not quite in the right place. Shaking his head he trudged back up the moorland slope. His Shimano cycling trainers were now soaked and pungent mud splashed up his legs to match the colour of his shorts. Luckily, the bike was not too heavy. He was expecting to have lunch in Llangollen and be home before dusk. Even so it was a labour made worse by the thought of the downhill all the way to tea and chips if only he hadn’t gone wrong. But where? Again he stopped to survey the landscape, losing some of its magnificence as worry crept in. He could see no sign of a road or even of any track. He knew he had to come across the road by continuing up the hill even if he had to go all the way to the summit of Esclusham Mountain. It was only another mile at the most. He returned to the rock with his bike and patted the saddle. He frowned all the way picking his way in between gorse, blackthorn, cotton-grass and emerald bog-moss. He knew he’d reached the top because he’d started descending. Where was the concrete trig point? It used to mark the summit. He shielded his eyes from the sun to take comfort from seeing signs of civilisation to the east and north. He should be able to see Minera village only a mile away, even Wrexham was only three or four. Nothing. There was an obscuring haze so that was probably why. No evidence that Nature had been tamed, trampled on or converted. He shook his head again. The summit to this hill is a bit of a ridge and he must have hit the wrong end to find the cairn. He was relieved to see his bike taking a breather by the boulder. “Come with me,” he told it as he shouldered it to go cross-country downhill due south towards the sun. He had to hit the little dead-end limestone gorge of World’s End and Eglwyseg. All the way, getting wetter, muddier and more tired he mocked himself since the lane must be just a few hundred yards to his right – or left. He was not going to be distracted by trying to find it though and lolloped on. As he entered the tree-line the way became steeper and more treacherous making him wonder more. The lane should hug the limestone escarpment around where he was. The road engineers centuries before had to level part of the slope but he couldn’t find it. He was sure he should have met fences but there was none. He fell into a boulder-strewn stream. He laughed as he thought he recognised it. Although the hydrological dynamics of erosion meant the stream was constantly changing, the type of rocks, its size, the incredibly clear water added up to the World’s End stream. All he had to do was follow it. It should be forded by the road at World’s End and bridged farther downstream. He was very fond of the cul-de-sac gorge so swapping the bike from his sore right shoulder to the left he stomped and splashed upstream. Twenty minutes later he was in no doubt of two facts. He was definitely sitting down on a limestone scree-slope at World’s End and he must have lost his marbles. He walked around where the road should be and waved his arms around where a stout wooden fence and stile should have stopped him. He knew the lead-ore was worked for centuries in the area and that the caves at World’s End were worked in early medieval days, maybe Roman. Yes, the caves were there and what might have been grown-over spoil heaps. He was troubled by the lack of any artefacts. He’d hoped to see rails or timber supports. These workings could just as well have been natural limestone caves. Did that mean he was back before the Romans? Was he going to find that racing-cycling group equally bewildered carrying their bikes through the trees? Maybe their collective exuberance activated a time-warp. He sat where the stile should have been and finished off his energy drink. He refilled the bottle from the stream. “I could go back to Minera and hopefully travel through the time gate or whatever,” he said to the pied wagtail on the other side of the stream. “But it would be mostly downhill to Llangollen either alongside the stream or contouring the escarpment. I know a great footpath along there. Or I did.” The bird wagged its tail. He opened the pannier and took a packet of trailmix he always carried for emergencies. My humorous thriller, Escaping Reality also contains a hilarious, dangerous bike ride on the English / Scottish border. See the page for it here. A new story published recently and it will only cost you 50p (80 cents) or less than the biscotti for your coffee. Publisher’s website with more details and formats. Another science fiction book you might like of mine uses a bit of quantum mechanics but in a fun way. EXIT, PURSUED BY A BEE After timequakes cause chaos, a Mars mission is diverted to chase departing mysterious spheres. Will the spheres listen and return before Earth rips apart?